"From time immemorial, the Church has celebrated the Most-holy Theotokos as the patroness and protectress of the Christian people, who, by her intercessory prayers, implores God's mercy for us sinners. The help of the Most-holy Mother of God has been clearly shown numerous times, to individuals and to nations, in peace and in war, in monastic deserts and in densely populated cities. 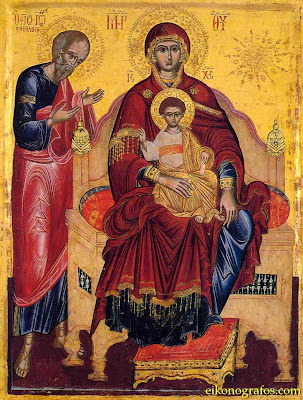 The event that the Church commemorates and celebrates today confirms the Theotokos' consistent protection of Christian people. On October 1, 911, during the reign of Emperor Leo the Wise, there was an All-night Vigil in the Blachernae Church of the Mother of God in Constantinople. The church was full of people. 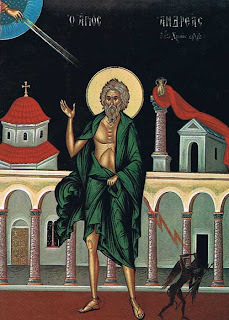 St. Andrew the Fool-for-Christ was standing in the rear of the church with his disciple Epiphanius. 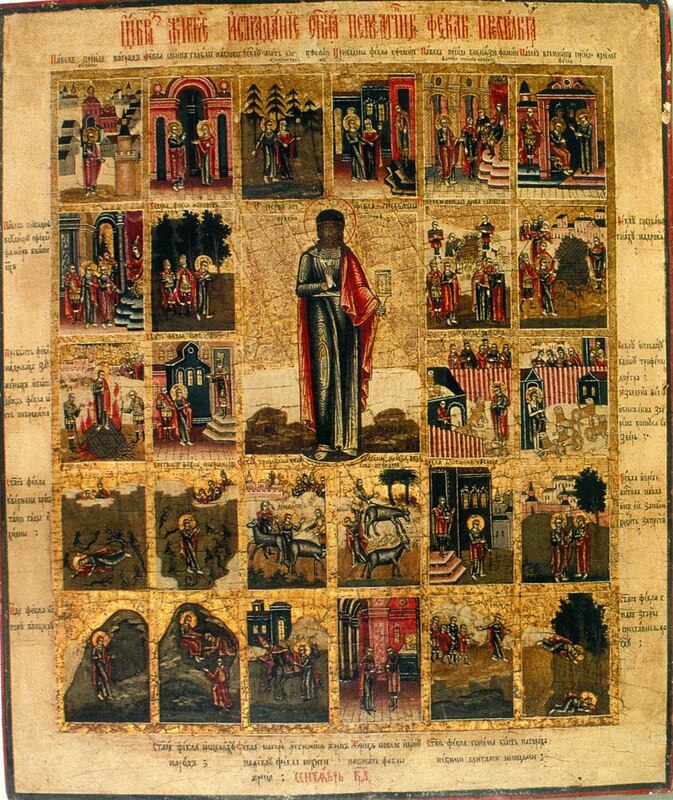 "In the PROLOGUE, a Russian book of the twelfth century, a description of the establishment of the special Feast marking this event states, "For when we heard, we realized how wondrous and merciful was the vision... and it transpired that Your holy Protection should not remain without festal celebration, O Ever-Blessed One!" 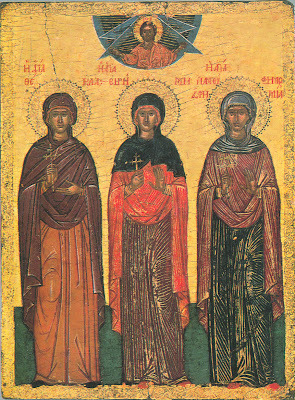 Therefore, in the festal celebration of the Protection of the Mother of God, the Russian Church sings, "With the choirs of the Angels, O Sovereign Lady, with the venerable and glorious prophets, with the First-Ranked Apostles and with the Hieromartyrs and Hierarchs, pray for us sinners, glorifying the Feast of your Protection in the Russian Land." 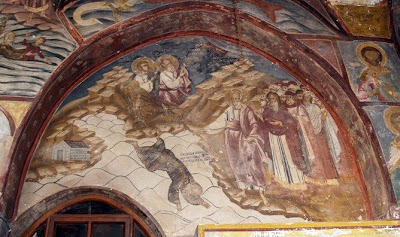 Moreover, it would seem that St Andrew, contemplating the miraculous vision was a Slav, was taken captive, and became the slave of the local inhabitant of Constantinople named Theognostus. 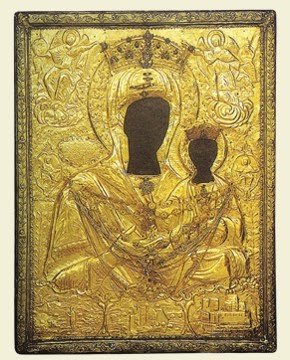 Churches in honor of the Protection of the Mother of God began to appear in Russia in the twelfth century. Widely known for its architectural merit is the temple of the Protection at Nerl, which was built in the year 1165 by holy Prince Andrew Bogoliubsky. The efforts of this holy prince also established in the Russian Church the Feast of the Protection of the Mother of God, about the year 1164. At Novgorod in the twelfth century there was a monastery of the Protection of the Most Holy Theotokos (the so-called Zverin monastery) In Moscow also under Tsar Ivan the Terrible the cathedral of the Protection of the Mother of God was built at the church of the Holy Trinity (known as the church of St Basil the Blessed). "The role of faith in Virgin Mary in Epirus is also outstanding during the Second World War. 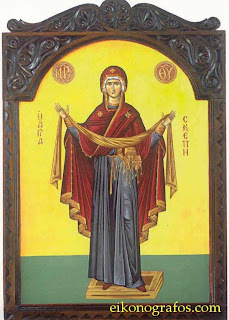 Her role was catalytic not only because she constituted the basis of people’s faith, but also because, with her miraculous interventions, she proved to have been the greatest ally of the Greek army on the snowy and rough mountains of Epirus. Of course, miracles and apparitions were reported in many regions of Greece during the war, but at the front, at the Greek – Albanian borders and on Pindus, Virgin Mary was the protector and the leader of those who fought for their country under difficult circumstances. 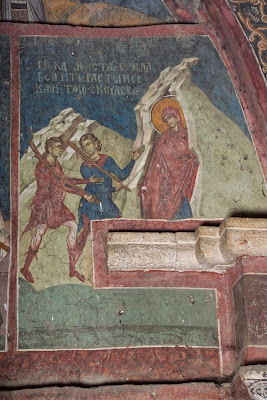 Their faith was so strong that they could see her encouraging them and “covering” them protectively, while they were fighting on the snowy mountains of Pindus and Albania. The account given by Vassililki Bouri, niece of Spyridon Houliaras, who fought at the borders, is characteristic. According to it, Spyridon Houliaras used to narrate incidents of the war to his relatives before he died. The one that affected him the most, however, was a miracle of Virgin Mary. While the soldiers were fighting under really adverse conditions, Virgin Mary appeared in front of them and as a protector “covered” them with her mantle and led them towards their enemy, ready to confront them. This miracle is also corroborated by the accounts of other soldiers of that time who fought on the mountains of Pindus. At the front, Greek soldiers saw the same vision everywhere: at nights, they could see a tall, slim woman figure walking with her kerchief resting on her shoulders. For the soldiers she was no other than Virgin Mary, the defender general of Greeks. It was also characteristic that on the military identification cards, right next to the personal details there was a picture of Virgin Mary. And just moments before they attacked, they would pray, shout “Panaghia mou!” (my Virgin) three times, and dash forth9. O Virgin, we extol the great grace of thy Protection, which thou didst spread out like a bright cloud beyond all understanding; for thou dost invisibly protect thy people from the foe's every assault. Since we have thee as our shelter and certain help, we cry to thee with our whole soul: Glory to thy great deeds, O most pure Maid. Glory to thy shelter most divine. Glory to thy care and providence for us, O spotless one. 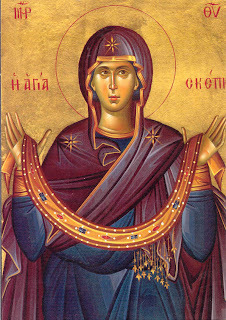 Let us the faithful hasten to the Theotokos now and venerate her sacred veil, as we chant unto her, singing hymns to praise and honour her, as is fitting; for she shelt'reth with her shelter and all her faithful flock and preserveth them unharmed from all calamities, as they cry to her: Rejoice, Protection most radiant. "Chariton was a distinguished and devout citizen of the city of Iconium. Imbued with the spirit of his compatriot, St. Thecla, Chariton openly confessed the name of Christ. When a bitter persecution of Christians began during the reign of Emperor Aurelian, Chariton was immediately brought to trial before the eparch. The judge ordered him to worship the gods, but Chariton replied: ``All your gods are demons, and were cast from the heavens into the nethermost hell.'' Chariton clearly proclaimed his faith in the One Living God, the Creator of all, and the Lord Jesus, the Savior of mankind. The eparch ordered that he be tortured and beaten, until his whole body was like one great wound. When Aurelian's evil deeds caught up with him and he died an evil death, Chariton was freed from torture and prison. He then set out for Jerusalem. On the way he was seized by robbers, but escaped from them by God's providence. Chariton, not wanting to return to Iconium again, withdrew to the wilderness of Pharan, where he founded a monastery and gathered monks. He established a rule for the monastery and then, to avoid the praise of men, withdrew to another wilderness near Jericho. There he founded another monastery called the Monastery of Chariton. Finally, he founded a third monastery, Souka, which the Greeks called the Old Lavra. Chariton died at a great old age, and took up his abode in the glory of his Lord on September 28, 350. 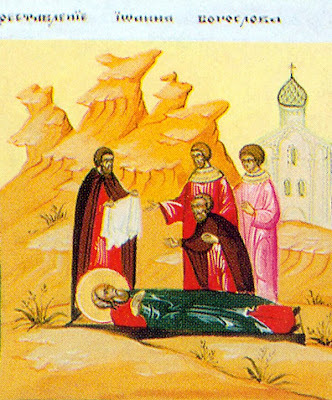 His relics repose in his first monastery. The composition of the rite of monastic tonsure is attributed to St. Chariton. With the rivers of your tears, you have made the barren desert fertile. Through sighs of sorrow from deep within you, your labors have borne fruit a hundred-fold. By your miracles you have become a light, shining upon the world. O Chariton, our Holy Father, pray to Christ our God, to save our souls. Delighting in abstinence, O godly-minded one, and reining in the desires of thy flesh, thou wast seen to be increasing in faith. And thou didst blossom forth like the tree of life in the midst of Eden, O all-blessed and most sacred Chariton. Here are some common Patron Saints for the month of September (and again, this is by no means a comprehensive list). 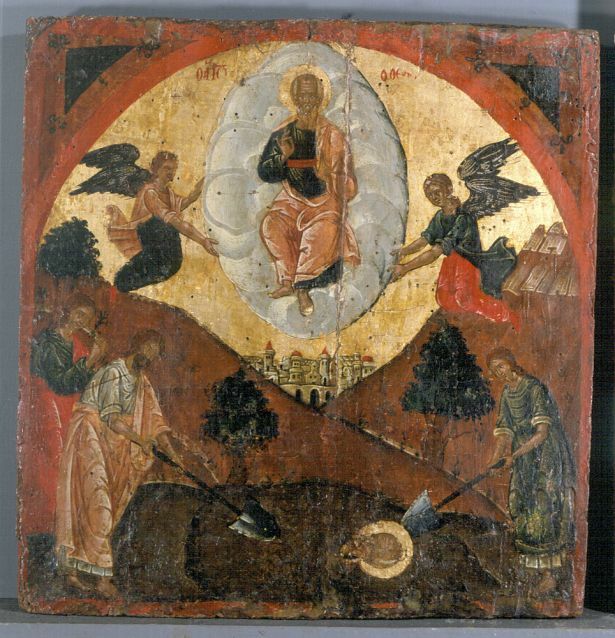 The sources are http://oasigr.5.forumer.com/a/_post1688.html and http://orthodoxwiki.org/Patron_saint primarily. Here are some common Patron Saints for the month of August (and again, this is by no means a comprehensive list). 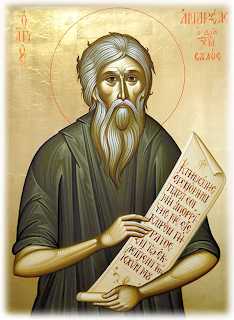 The sources are http://oasigr.5.forumer.com/a/_post1688.html and http://orthodoxwiki.org/Patron_saint primarily. "The Holy, Glorious All-laudable Apostle and Evangelist, Virgin, and Beloved Friend of Christ, John the Theologian was the son of Zebedee and Salome, a daughter of St Joseph the Betrothed. He was called by our Lord Jesus Christ to be one of His Apostles at the same time as his elder brother James. This took place at Lake Gennesareth (i.e. the Sea of Galilee). Leaving behind their father, both brothers followed the Lord. The Apostle John was especially loved by the Savior for his sacrificial love and his virginal purity. After his calling, the Apostle John did not part from the Lord, and he was one of the three apostles who were particularly close to Him. St John the Theologian was present when the Lord restored the daughter of Jairus to life, and he was a witness to the Transfiguration of the Lord on Mount Tabor. During the Last Supper, he reclined next to the Lord, and laid his head upon His breast. He also asked the name of the Savior's betrayer. 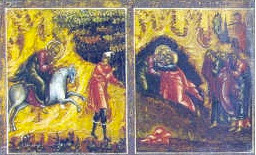 The Apostle John followed after the Lord when they led Him bound from the Garden of Gethsemane to the court of the iniquitous High Priests Annas and Caiphas. He was there in the courtyard of the High Priest during the interrogations of his Teacher and he resolutely followed after him on the way to Golgotha, grieving with all his heart. At the foot of the Cross he stood with the Mother of God and heard the words of the Crucified Lord addressed to Her from the Cross: "Woman, behold Thy son." Then the Lord said to him, "Behold thy Mother" (John 19:26-27). 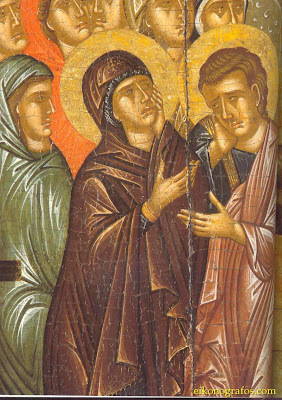 From that moment the Apostle John, like a loving son, concerned himself over the Most Holy Virgin Mary, and he served Her until Her Dormition. 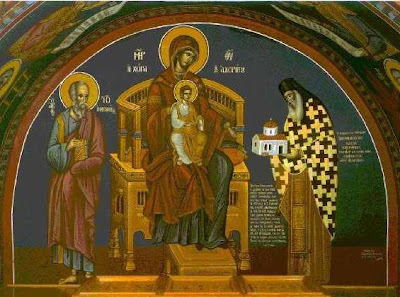 After the Dormition of the Mother of God the Apostle John went to Ephesus and other cities of Asia Minor to preach the Gospel, taking with him his own disciple Prochorus. They boarded a ship, which floundered during a terrible tempest. All the travellers were cast up upon dry ground, and only the Apostle John remained in the depths of the sea. Prochorus wept bitterly, bereft of his spiritual father and guide, and he went on towards Ephesus alone. On the fourteenth day of his journey he stood at the shore of the sea and saw that the waves had cast a man ashore. Going up to him, he recognized the Apostle John, whom the Lord had preserved alive for fourteen days in the sea. Teacher and disciple went to Ephesus, where the Apostle John preached incessantly to the pagans about Christ. His preaching was accompanied by such numerous and great miracles, that the number of believers increased with each day. During this time there had begun a persecution of Christians under the emperor Nero (56-68). They took the Apostle John for trial at Rome. St John was sentenced to death for his confession of faith in the Lord Jesus Christ, but the Lord preserved His chosen one. The apostle drank a cup of deadly poison, but he remained alive. Later, he emerged unharmed from a cauldron of boiling oil into which he had been thrown on orders from the torturer. After this, they sent the Apostle John off to imprisonment to the island of Patmos, where he spent many years. Proceeding along on his way to the place of exile, St John worked many miracles. 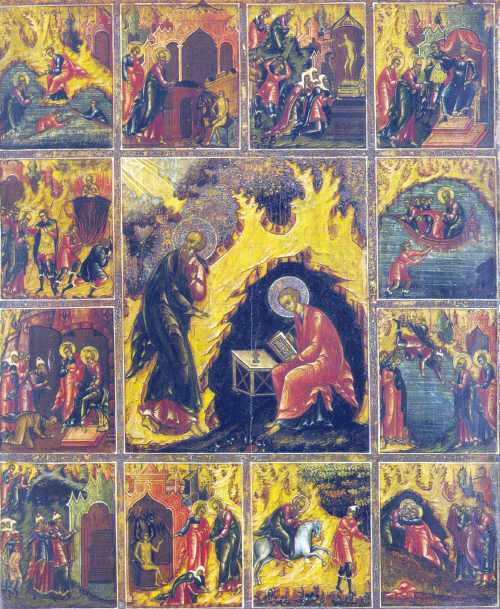 On the island of Patmos, his preaching and miracles attracted to him all the inhabitants of the island, and he enlightened them with the light of the Gospel. He cast out many devils from the pagan temples, and he healed a great multitude of the sick. Sorcerers with demonic powers showed great hostility to the preaching of the holy apostle. He especially frightened the chief sorcerer of them all, named Kinops, who boasted that they would destroy the apostle. 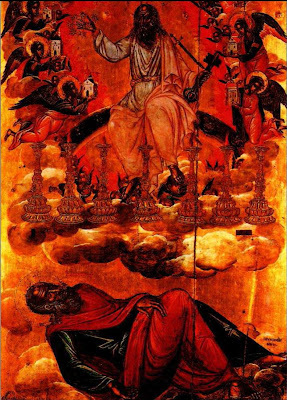 But the great John, by the grace of God acting through him, destroyed all the demonic artifices to which Kinops resorted, and the haughty sorcerer perished in the depths of the sea. The Apostle John withdrew with his disciple Prochorus to a desolate height, where he imposed upon himself a three-day fast. As St John prayed the earth quaked and thunder rumbled. Prochorus fell to the ground in fright. The Apostle John lifted him up and told him to write down what he was about to say. "I am the Alpha and the Omega, the beginning and the end, saith the Lord, Who is and Who was and Who is to come, the Almighty" (Rev 1:8), proclaimed the Spirit of God through the Apostle John. Thus in about the year 67 the Book of Revelation was written, known also as the "Apocalypse," of the holy Apostle John the Theologian. In this Book were predictions of the tribulations of the Church and of the end of the world. After his prolonged exile, the Apostle John received his freedom and returned to Ephesus, where he continued with his activity, instructing Christians to guard against false teachers and their erroneous teachings. In the year 95, the Apostle John wrote his Gospel at Ephesus. He called for all Christians to love the Lord and one another, and by this to fulfill the commands of Christ. The Church calls St John the "Apostle of Love", since he constantly taught that without love man cannot come near to God. 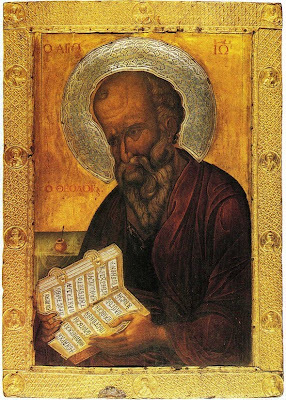 In his three Epistles, St John speaks of the significance of love for God and for neighbor. Already in his old age, he learned of a youth who had strayed from the true path to follow the leader of a band of robbers, so St John went out into the wilderness to seek him. Seeing the holy Elder, the guilty one tried to hide himself, but the Apostle John ran after him and besought him to stop. He promised to take the sins of the youth upon himself, if only he would repent and not bring ruin upon his soul. Shaken by the intense love of the holy Elder, the youth actually did repent and turn his life around. St John when he was more than a hundred years old. he far outlived the other eyewitnesses of the Lord, and for a long time he remained the only remaining eyewitness of the earthly life of the Savior. When it was time for the departure of the Apostle John, he went out beyond the city limits of Ephesus with the families of his disciples. He bade them prepare for him a cross-shaped grave, in which he lay, telling his disciples that they should cover him over with the soil. The disciples tearfully kissed their beloved teacher, but not wanting to be disobedient, they fulfilled his bidding. They covered the face of the saint with a cloth and filled in the grave. 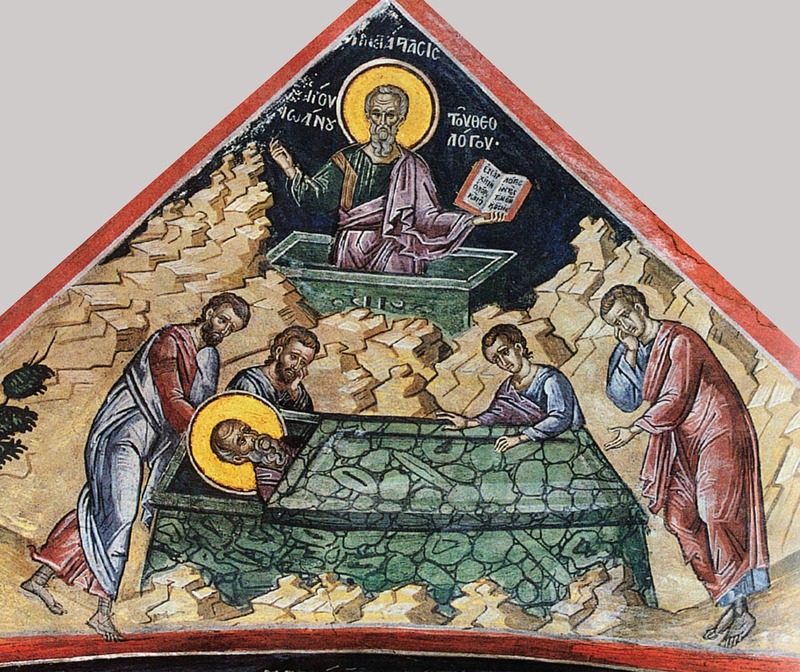 Learning of this, other disciples of St John came to the place of his burial. When they opened the grave, they found it empty. The Lord bestowed on His beloved disciple John and John's brother James the name "Sons of Thunder" as an awesome messenger in its cleansing power of the heavenly fire. And precisely by this the Savior pointed out the flaming, fiery, sacrificial character of Christian love, the preacher of which was the Apostle John the Theologian. The eagle, symbol of the lofty heights of his theological thought, is the iconographic symbol of the Evangelist John the Theologian. 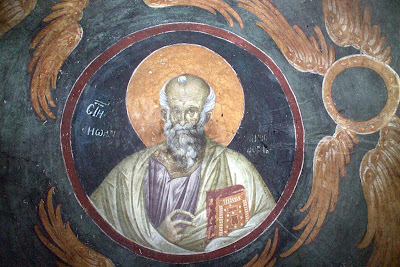 The appellation "Theologian" is bestown by Holy Church only to St John among the immediate disciples and Apostles of Christ, as being the seer of the mysterious Judgments of God." 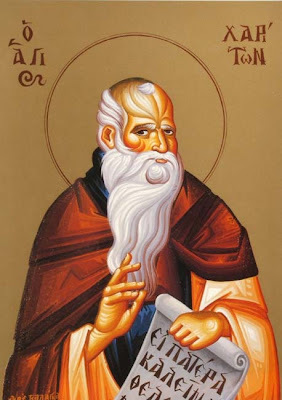 "While he was on Patmos, John received a letter from the Bishop of Athens, Dionysius the Areopagite (October 3) who was then ninety-nine years old. He praised John as the daystar of the Gospel and prophesied that he would soon be freed. Indeed when Trajan succeeded Nerva (AD 98), he recalled Saint John to Ephesus, to the great sorrow of the people of Patmos whom he had converted. John did not want to leave them unconsoled. Strengthened by a sign from heaven, he fasted with them for three days; then, accompanied by Prochorus, he went up into a mountain where he directed all the powers of his soul towards the Lord. Suddenly the sky was rent by fearful flashes of lightening and claps of thunder. Prochorus was overwhelmed and fell to the ground while John remained impassible in contemplation. He heard a voice like thunder proclaiming from the height of heaven: “In the beginning was the Word, and the Word was with God, and the Word was God” (John 1:1). Prochorus transcribed this message of salvation, revealed to John as was once the Law to Moses on Mount Sinai, but this time not for the Jews alone, but for all even to the ends of the earth. "Patmos is the northernmost island of the Dodecanese and is populated with churches and communities of Orthodox Christians. During the period of Roman rule, the island fell into a decline. The population decreased, and the island became a place for banishing criminals or political and religious troublemakers. In 95 AD, St. John the Theologian was sent into exile on the island as a religious troublemaker. He remained on the island for eighteen months during which he lived in a cave below a known temple, at the time, dedicated to Diana. 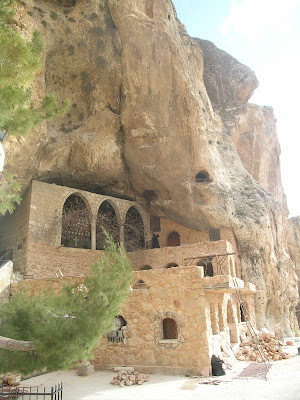 In this cave, he narrated a vision he was having of Jesus that is the Book of Revelation...In 313 AD, Christianity was recognised by the Roman Empire and this also spread to the Dodecanesse. The empire of the Byzantium exercised control of Patmos and the other islands and by the 4th century the temple to Diana had been removed. Directly over this temple a church dedicated to St. John the Theologian was built but this was destroyed later between the 6th and 9th centuries during a series of raids by various Arab groups. During the Turco-Italian War of 1912, Patmos was captured and controlled by the Italians. The island remained under their control until the end of World War II, when it was returned to Greece. 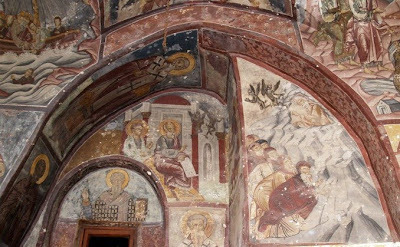 The whole island is dominated by the two monasteries, built in his honour and memory, and Chora, the island’s historic center, are all declared World Heritage sites by UNESCO in 2006. 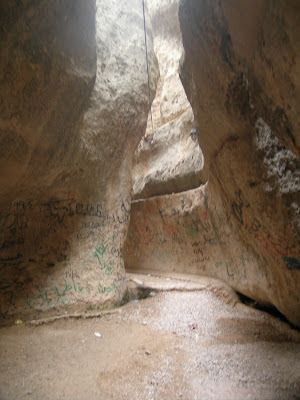 For the church [tradition], this proves that Christ's feet were touching the floor of the cave for if it had been a vision in heaven, he would not have been able to fall at His feet. This wondrous bodily presence of the Lord in the cave is reason ascribed to the great earthquake that made the rock in the Cave of the Apocalypse split in three forming a witness to the doctrine of the Holy Trinity. [According to this church tradition], this is the only location in Europe that God has walked making it the most sacred destination in Europe, followed by Mount Athos. According to popular belief, if one looks across the water from the Monastery of St. John on a clear day, it is possible to see a rock standing alone in the middle of the sea. The rock looks like an overturned ship with its keel facing up towards the sky. 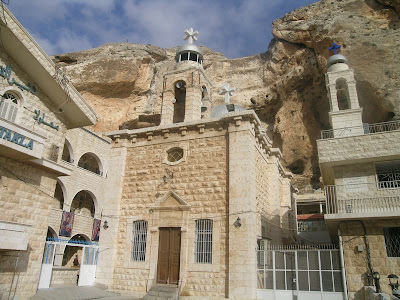 "The Rock of Kynops refers to a strange looking rock jutting out of the sea in Petra Bay believed to be the petrified body of a satanical wizard by the name of Kynops destroyed during spiritual combat between Kynops and St. John the Theologian. The story of this combat is attributed to the saint's disciple, Prochorus, and contained in an ancient manuscript still kept hidden in the monastery on Patmos island. Today some 200-300 metres from the point where the big ships now dock at Skala. In the dock itself, there exists a red (or orange) buoy to mark the spot where, just beneath the surface, is a submerged rock that, some people say, is man-shaped and represents the petrified magician. The island of Patmos is a home to a great number of monasteries and churches, most of which are listed at the following site from the Ecumenical Patriarch: http://www.ec-patr.org/patrdisplay.php?lang=en&id=8. One of the great Elders of our times, Elder Amphilochios Makris, was the Abbot of the Monastery of St. John for many years. See the following for more information: http://www.agrino.org/cyberdesert/makris.htm, http://orthodoxwiki.org/Amphilochios_(Makris). 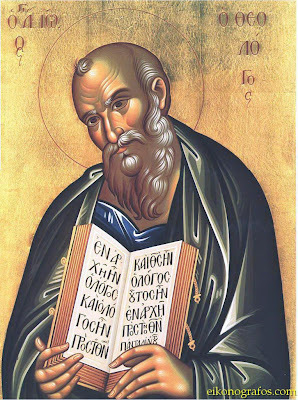 May St. John the Theologian, the Beloved Apostle of Christ, intercede for us and help us all! Beloved Apostle of Christ our God, hasten, deliver a people without defense. As he accepted that you lean upon his breast, he accepts you as you fall before him. Implore him, O Theologian, and scatter the persistent cloud of nations, asking for us peace and his great mercy. Who will recount your mighty works, O Virgin, for you pour out wonders and are a source of healings, and you intercede on behalf of our souls, as Theologian and friend of Christ. To learn wholly the high secrets of heaven, to investigate the depths of the sea is rash and beyond comprehension; as therefore it is wholly impossible to number all the stars and the sand on the sea shore, so it is to tell the graces of the Theologian, with so many crowns Christ has garlanded the one he loved; the one who leant on his breast and feasted with him at the mystical supper, as Theologian and friend of Christ. 9th Ode of the Canon of the Saint. Glory. Tone 8. Now not dimly, but face to face, you have been granted to see the flood of delight, the river of peace, and the fount of immortality; drawing from which you divine life. 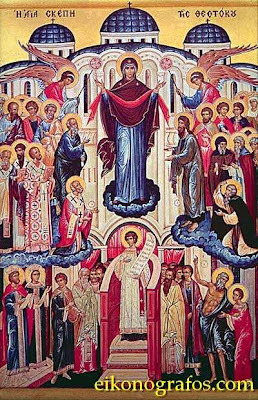 You asked to receive an earthly seat from Christ; but he himself gave you his breast, O Theologian, leaning on which, the only sure stay, you were enriched with goodness, O ornament of Apostles. 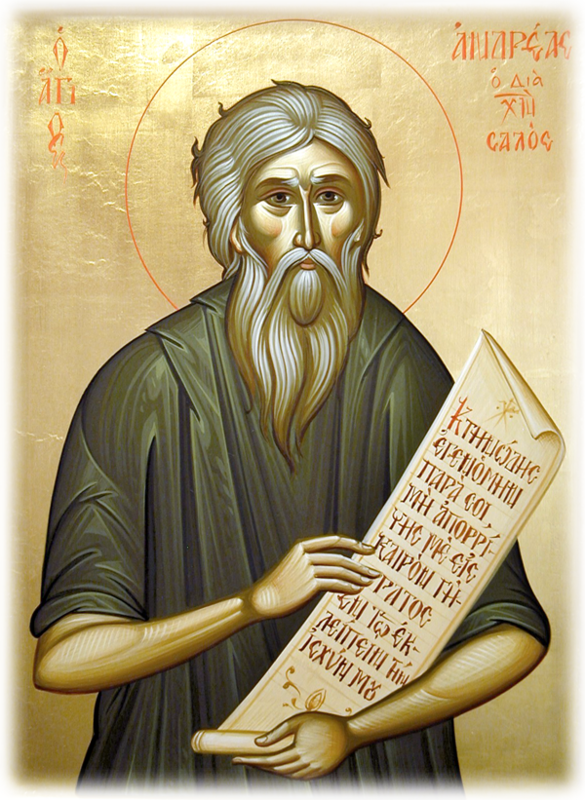 You quenched the godlessness of Greek wisdom, wise Apostle, when you proclaimed: In the beginning was the Word, and the Word was with God and the Word was truly God, though whom all things came to be, both visible and invisible. Like early dawn you were found, blazing in the night of life with the rays of virginity, revealing to us the dawn of the spiritual Sun of justice, O all-honoured Mother of God. Another. It is impossible for mortals. Sovereign Lord of times and seasons, the Redeemer was hanged upon the tree in the middle of the day and entrusted to you, blessed Apostle, as a virgin, the Ever-Virgin, giving an irremovable glory to magnify you. Even as you join with the divine Powers above and with them cry aloud the divine song, save by your mediations, those who chant and praise in your holy house the One who is supremely good, O Apostle of Christ. Save from every danger, blessed Theologian, us who with faith call on you for help, in spirit direct our paths towards the Lord and guide us to the way of peace, the commandments of the Almighty. Let us now bring to God's Mother an outstanding prayer of thanks, and let us now cry out: Hail, most high throne of God; hail cloud of light; hail, paradise, through whom may we be worthy of the delight of Paradise. Doxastikon of the Praises - Glory. Tone 8. Evangelist John, Virgin equal to the Angels, Theologian taught by God, with right belief you proclaimed to the world the immaculate side which poured forth blood and water, by which we procure eternal life for our souls. 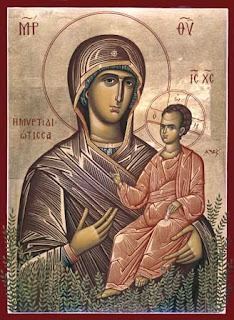 "The Icon of the Most Holy Theotokos "Of the Myrtle Tree" (Myrtidiotissa) is in the monastery church of Myrtides on the Greek island of Kythera. It derives its name from the fact that it was found in a myrtle bush in the fourteenth century. At that time, a shepherd was tending his sheep in a deserted valley which was filled with myrtle bushes. On September 24, forty days after the Dormition, the Mother of God appeared to him and told him to seek her icon which had been brought to that place many years before. 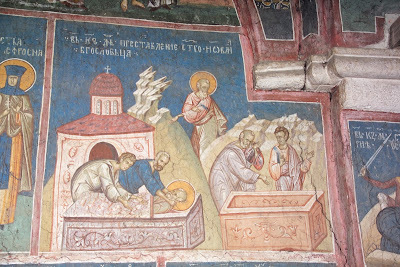 The shepherd fell to the ground in amazement, praying to the Theotokos. As soon as he got up and turned around, he saw the icon in the branches of a myrtle bush. Weeping for joy, he brought the icon home and told his friends and relatives about how he had found it. When he awoke the next morning, the shepherd found the icon missing, and thought that perhaps someone had stolen it during the night. With a heavy heart, he led his sheep back to the spot where he had found the icon. To his amazement, he saw the icon once again in the branches of the myrtle bush. Glorifying God, the man took the icon home with him once more. The next morning, it had disappeared just as it had before. When this happened a third time, the shepherd realized that the Mother of God wanted her icon to remain where it had first appeared. A small church was built to house the icon, and was called "Of the Myrtle Tree," after the icon. The building was replaced and enlarged over the years, and many miracles took place there. 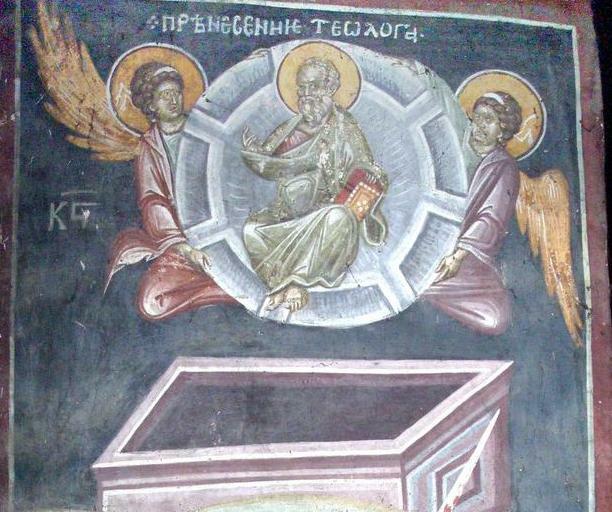 At the end of the sixteenth century Theodore Koumprianos, a descendant of the shepherd who found the icon, lived in the village of Kousoumari. He was a paralytic, and had an unshakeable faith that the Mother of God would heal him. Each year on September 24 he sent a family member to the church to light candles for him. One year he asked to be carried there by his family so that he might venerate the icon himself. During the Vigil, a great noise was heard coming from the direction of the sea. People fled the church, thinking that pirates were attacking. 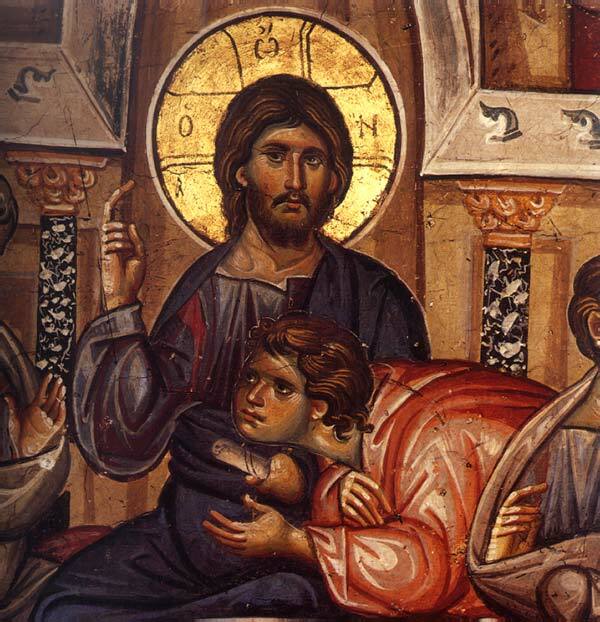 The paralytic remained in the church by himself, entreating the Mother of God for protection. Suddenly, he heard a voice from the icon telling him to get up and flee. He stood up, and then walked out of the church. Soon he was able to run and catch up with his relatives, who rejoiced upon seeing this miracle. 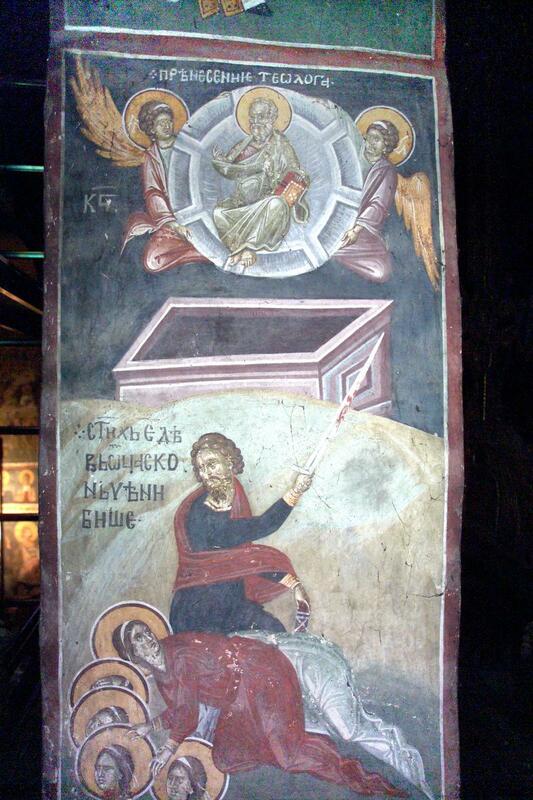 As it turned out, there was no pirate attack, and the noise was regarded as a sign of God's providence so that the paralytic could remain alone in church with the icon. Since that time the Koumprianos family has celebrated the icon's Feast Day with a special reverence, since Theodore had been healed on that day. 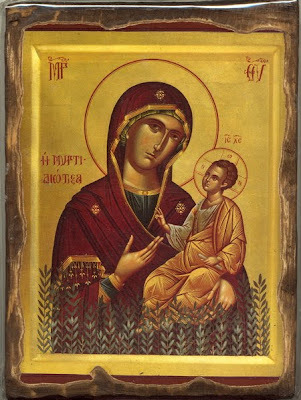 Some of the other miracles associated with the Most Holy Theotokos and her icon "Of the Myrtle Tree" include protection of the island from the plague, ending the barrenness of a Jewish woman from Alexandria, saving people from death, and many other great wonders. A ship was traveling at sea, when there began a terrible storm. Frigid fear seized the captain and crew. It was not like today. Then the boats were wooden. And they had sails! And the old boat started leaking. The pump worked continuously, but it didn’t do any good, and the boat started to sink. If the ship were lost what good were lifeboats and life jackets? All felt that every hope was lost. And then their minds turned to the Virgin Mary, who is the "hope of the hopeless”. "I’ve come! Don’t be afraid! Your ship will be saved! All of them knelt in front of the Panagia. They did their cross in reverence. They thanked her from the depth of their souls, and offered their small gifts, which are kept up till the present day. Λαοί νῦν κροτήσωμεν,δεῦτε τάς χεῖρας πιστῶς καί ἄσωμεν ἄσμασι τῇ Θεομήτορι ἐν πόθῳ κραυγάζοντες˙ Χαῖρε ἡ προστασία πάντων τῶν δεομένων Χαῖρε ἡ σωτηρία τῶν τιμώντων σε πόθῳ, Χαῖρε ἡ τῷ παραλύτῳ τήν ἴασιν βραβεύσασα. O people now let us clap our hands in faith and sing songs to the Mother of God crying out with fervor, Hail the protection of all those in danger, Hail the salvation of those who honor you with longing, Hail you who granted healing to the paralytic. Ρᾶνον θείοις μύροις τόν σόν λαόν, ἡ ἐν μυρτιδίοις ἀνατείλασα θαυμαστῶς, ἁγίᾳ Εἰκόνι, θαυματουργῷ καί θείᾳ, καί δίδου τήν σήν χάριν, Μυρτιδιώτισσα. 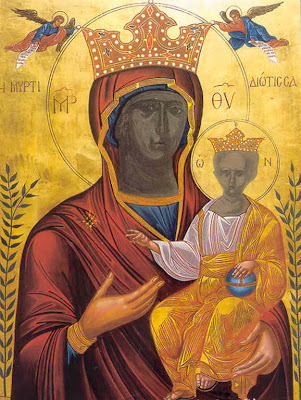 Sprinkle your people with divine myrrh, who in the myrtles shown forth wondrously, holy Icon, wondrous and divine, and grant your grace, Myrtidiotissa. 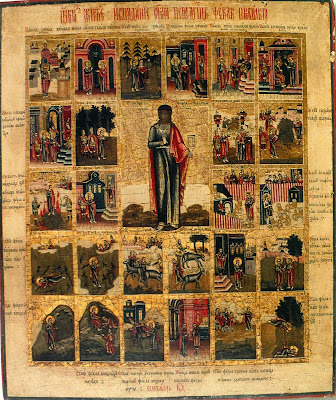 "The Holy Protomartyr and Equal of the Apostles Thekla was born in the city of Iconium. She was the daughter of rich and illustrious parents, and she was distinguished by extraordinary beauty. At eighteen years of age they betrothed her to an eminent youth. But after she heard the preaching of the holy Apostle Paul about the Savior, St Thekla with all her heart came to love the Lord Jesus Christ, and she steadfastly resolved not to enter into marriage, but rather to devote all her life to preaching the Gospel. St Thekla's mother was opposed to her daughter's plans and insisted that she marry her betrothed. St Thekla's fiancé also complained to the prefect of the city about the Apostle Paul, accusing him of turning his bride against him. The prefect locked up St Paul in prison. 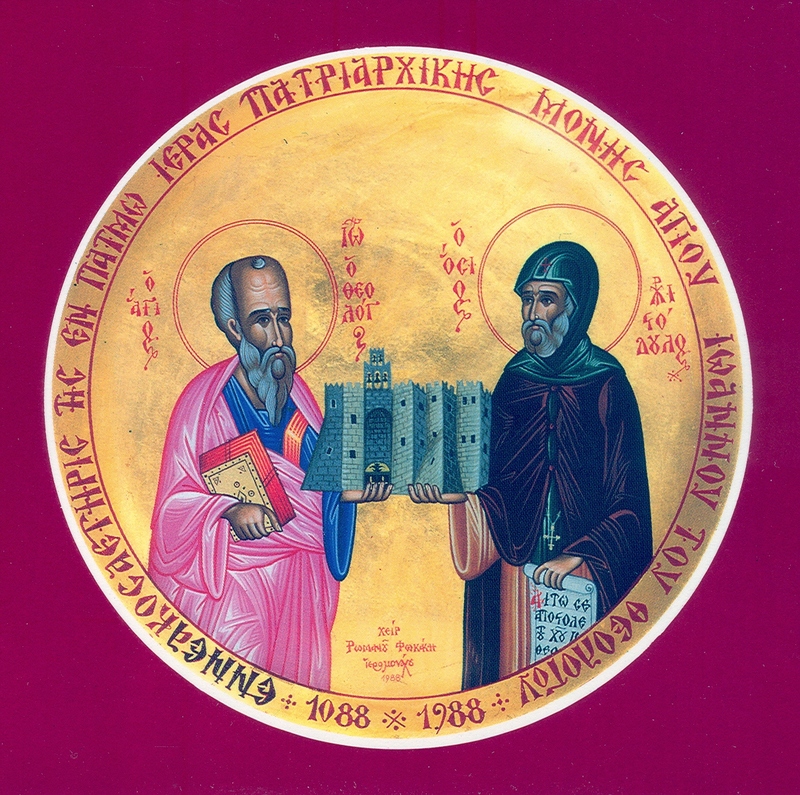 During the night St Thekla secretly ran away from her house, and she bribed the prison guards, giving them all her gold ornaments, and so made her way into the prison to the prisoner. For three days she sat at the feet of the Apostle Paul, listening to his fatherly precepts. Thekla's disappearance was discovered, and servants were sent out everywhere looking for her. Finally, they found her in the prison and brought her home by force. At his trial St Paul was sentenced to banishment from the city. Again they urged St Thekla to consent to the marriage, but she would not change her mind. Neither the tears of her mother, nor her wrath, nor the threats of the prefect could separate St Thekla from her love for the Heavenly Bridegroom, the Lord Jesus Christ. Her mother in a insane rage demanded from the judges a death sentence against her unyielding daughter, and St Thekla was sentenced to be burned. 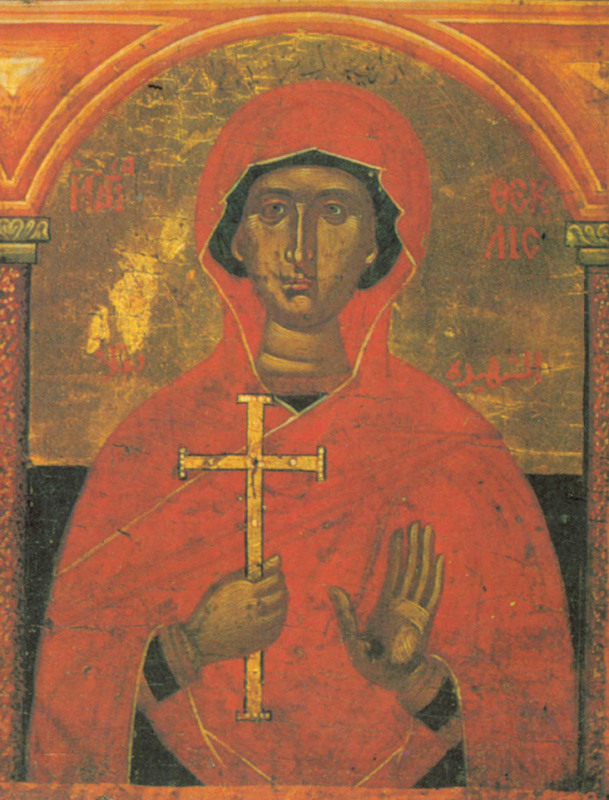 Without flinching, the holy martyr went into the fire and made the Sign of the Cross over herself. At this moment the Savior appeared to her, blessing her present deed, and inexpressible joy filled her holy soul. The flames of the fire shot up high, but the martyr was surrounded by a light and the flames did not touch her. Thunder boomed, and a strong downpour of rain and hail extinguished the fire. The torturers scattered in fear. 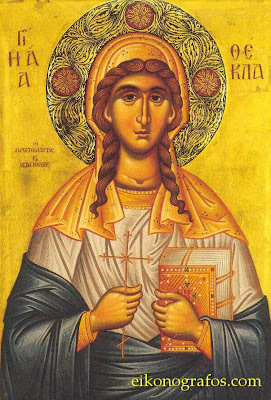 St Thekla, kept safe by the Lord, left the city and with the help of a certain Christian youth, searched for the Apostle Paul. 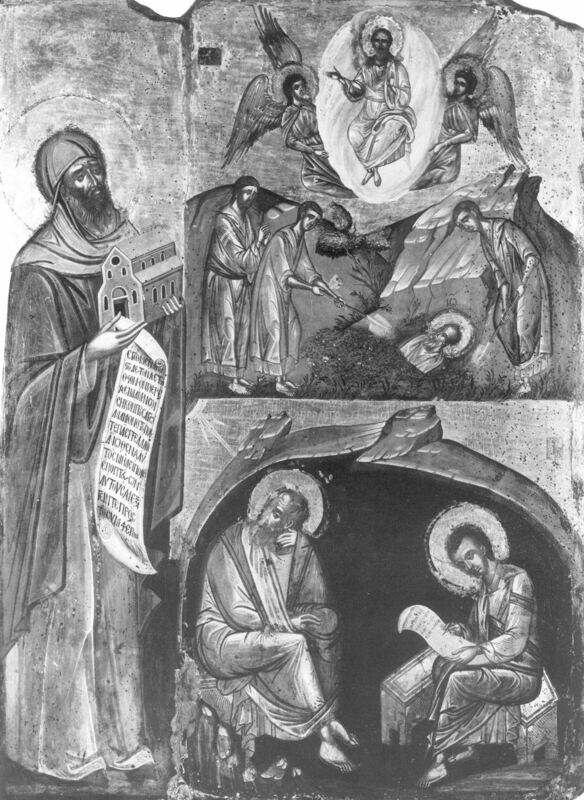 The holy apostle and his companions, among whom was St Barnabas, were hidden in a cave not far from the city, praying fervently, that the Lord would strengthen St Thekla in her sufferings. After this, St Thekla went with them preaching the Gospel in Antioch. In this city she was pursued by a certain dignitary named Alexander, who was captivated by her beauty. 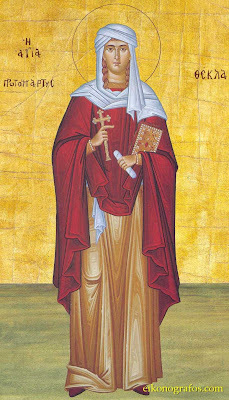 St Thekla refused his offer of marriage, and so she was condemned to death for being a Christian. Twice they set loose hungry wild animals upon her, but they would not touch the holy virgin. Instead, they lay down meekly and licked her feet. The Providence of God preserved the holy martyr unharmed through all her torments. Finally, they tied her to two oxen and began to chase her with red-hot rods, but the strong cords broke asunder like cobwebs, and the oxen ran off, leaving St Thekla unharmed. The people began shouting, "Great is the God of the Christians!" The prefect himself became terrified, realizing that the holy martyr was being kept safe by the Almighty God, Whom she served. He then gave orders to set free the servant of God Thekla. With the blessing of the Apostle Paul, St Thekla then settled in a desolate region of Isaurian Seleucia and dwelt there for many years, constantly preaching the Word of God and healing the sick through her prayer. 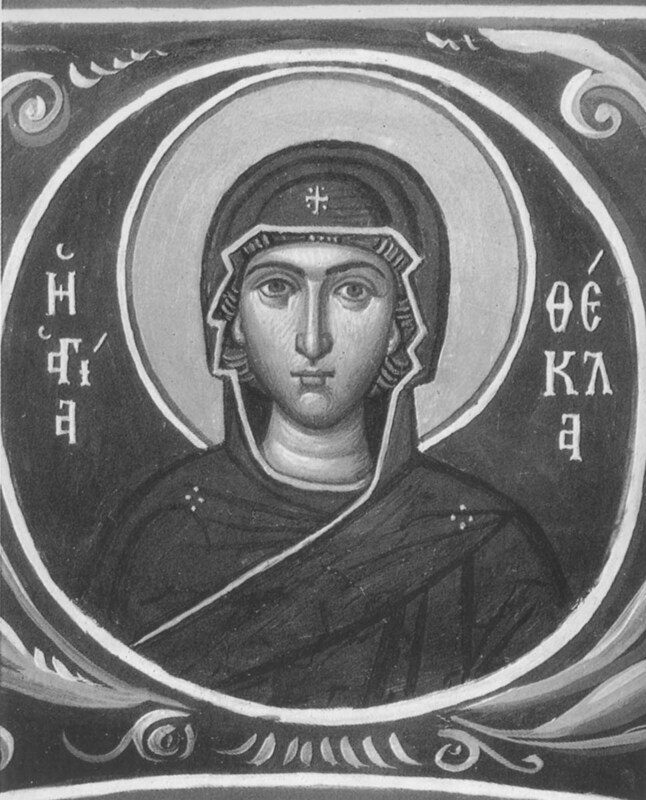 St Thekla converted many pagans to Christ, and the Church appropriately names her as "Equal- to-the-Apostles." Even a pagan priest, trying to assault her purity and punished for his impudence, was brought by her to holy Baptism. More than once the Enemy of the race of man tried to destroy St Thekla through people blinded by sin, but the power of God always preserved this faithful servant of Christ. When St Thekla was already a ninety-year-old woman, pagan sorcerers became incensed at her for treating the sick for free. They were unable to comprehend that the saint was healing the sick by the power of the grace of Christ, and they presumed that the virgin-goddess Artemis was her special helper. Envious of St Thekla, they sent their followers to defile her. When they came near her, St Thekla cried out for help to Christ the Savior, and a rock split open and hid the holy virgin, the bride of Christ. 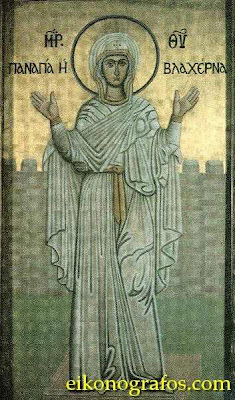 Thus did St Thekla offer up her holy soul to the Lord. According to one source, St. Thekla especially works many miracles with dermatologic and psychopathologic (or spiritual pathologic) illnesses. (http://www.synaxaristis.googlepages.com/%CE%B3%CE%B9%CE%B1%CF%84%CE%B9%CF%83%CE%B1%CF%83%CE%B8%CE%B5%CE%BD%CE%B5%CE%B9%CE%B5%CF%82). As mentioned, as the first woman martyr and a great ascetic and wonderworker, she is a guide and protector of nuns, and works many miracles throughout the world for the faithful. May she intercede for us all and help us! 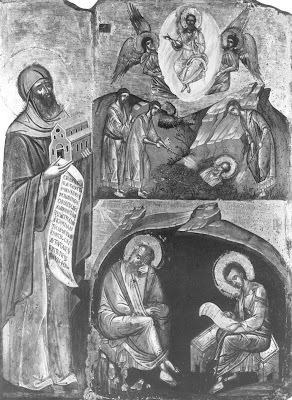 You were enlightened by the words of Paul, O Bride of God, Thekla, and your faith was confirmed by Peter, O Chosen One of God. You became the first sufferer and martyr among women, by entering into the flames as into a place of gladness. For when you accepted the Cross of Christ, the demonic powers were frightened away. O all-praised One, intercede before Christ God that our souls may be saved. You shone out with the beauty of virginity, you were adorned with a crown of martyrdom, you were entrusted with the work of an apostle, glorious Virgin; and you changed the fire’s flame to dew, while by prayer you tamed the raging of the bull as victorious first Champion. The brilliance of an honoured feast brightly outshines the sun; for blazing with beams of light it is mirrored in the eyes of the faithful; therefore as we dance with the Angels, let us all shout aloud to God our Saviour, as we cry to him: You have multiplied your mercies, O Saviour, by giving a perfect gift to your people: the victorious first Champion. 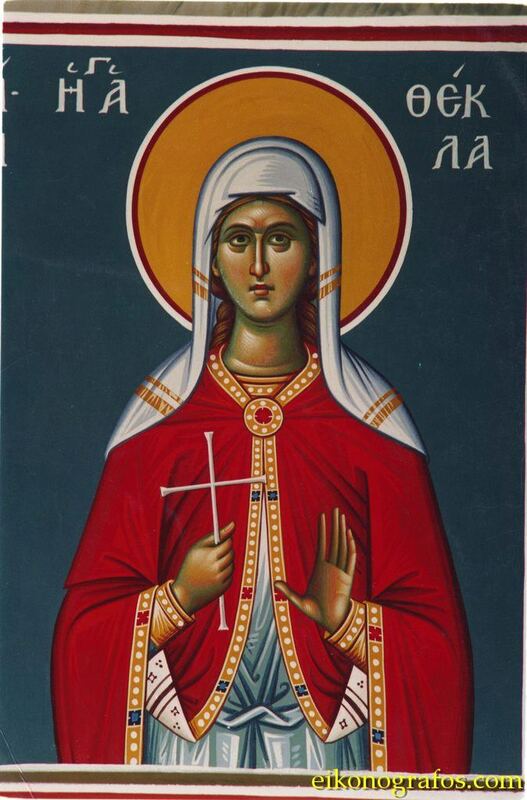 On the 24th of the same month, Commemoration of the Holy Great Martyr and Equal of the Apostles Thekla. He at whose passion once the rocks were rent. ‘Twas on the twenty fourth day that a rock enfolded great Thekla. Is there any who would not marvel, Protomartyr, at your indomitable courage? For having tamed the passions, wild beasts of the mind, you did not quail before the impotent assaults of wild beasts, but remained in their midst unharmed. Even the sheer untrodden rock was rent by God’s command for the god-bearing Martyr, sealed as God’s bride by the bath of rebirth; and like a bridal chamber for the fugitive it received her in its arms. Doctor the bruises of my soul, First Champion; crown the world with peace, giving victories to our faithful Sovereign against hostile barbarians and peace to the Churches by your supplications. Sovereign Lady, slay my sin that still lives, give life to the death of soul by the force of the true Life born from your womb through ineffable compassion for those who devoutly magnify you. The stadium of the contest lies before us to-day. Peoples, let us dance and let us observe the wondrous deeds that are accomplished there; for a spotless lamb, the fair virgin and bride of God Thekla is brought out for slaughter for the sake of Christ our God who was slaughtered; and so by the faith of the Trinity she destroyed the godlessness of tyrants and, as she dances with the Angels, she intercedes with the Saviour that our souls may be saved. 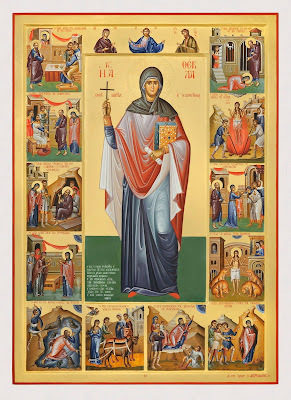 Brave champion Thekla, with Christ as your Bridegroom in heaven, you despised your earthly suitor; for wisely you did not yield to a mother’s flatteries, but followed Paul, taking on your shoulders the standard of the Cross. The fire did not harm you; you changed the savagery of the wild beasts to tameness; you slew seals by the descent into Christ that is holy Baptism. But, as you were distinguished by noble contests, do not cease to intercede continually with the Lord for those who in faith celebrate your ever-honoured memory. You dedicated yourself to the all-powerful will; strengthened as Christ’s champion and abandoning earthly love, you were declared the lamp of eternal life; you are a blessed bridal chamber, in which flocks of women, having found the entrance to eternal life take their rest. With them, Apostle Thekla, intercede for our souls. 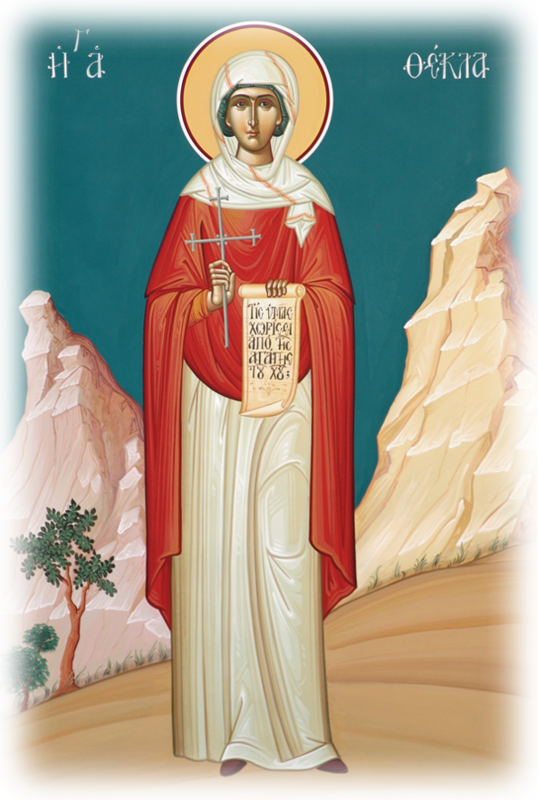 Lovers of martyrs, strike up the dance, for the season of contests is upon us, and the yearly memorial of the Protomartyr, which urges all to give glory to God: for Thekla, the first of Martyrs among women, has accomplished her contest, is the first to be declared the victor and she intercedes with boldness for our souls. Protomartyr of Christ, it was not only the races of mankind that marvelled but wild beasts too were astonished. 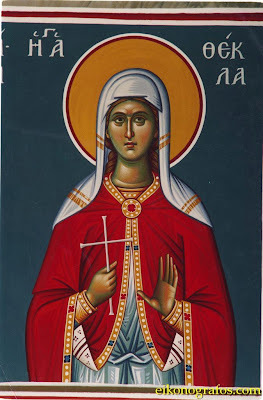 For you the flames were not reckoned as flames, fair virgin Thekla, because of your Bridegroom Christ, for you were glad as you suffered for him and were parted from the world that you might gain the blessedness of heaven as you intercede with boldness for our souls.